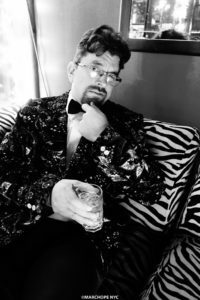 DJ Ryan Midnight has been an avid record collector and part of the ska scene since 1995, getting his start hosting a weekly radio show in high school and college under the moniker Earwig. He also published two ska-centric zines in the late 90s / early 00s – Magic Ate Ball and Jersey Chaos – reviewing albums and interviewing bands. After an extended hiatus – in which Ryan Midnight took to the pen writing movie and comic book reviews for a host of websites, including his own Movies at Midnight – the DJ aspect came full circle with a series of in-store and live streaming events for Jersey City-based Iris Records. During this time, Ryan also formed the Facebook page New York City Ska to get the word out on upcoming local ska shows and highlight regional bands. From there, Ryan started supporting live bands performing the NYC area, spinning tunes before and between sets for shows including The Selecter, The Toasters, The Porkers, Five Iron Frenzy, and Voodoo Glow Skulls, along with regular recurring DJ sets at Otto’s Shrunken Head. Recently, Ryan has started hosting the weekly podcast, 100% Ska, spinning all-vinyl sets covering the full spectrum of the genre and interviewing bands including The Pietasters and The Pandemics. DJ Ryan Midnight is available for booking at any NYC-area bar or club with a dedicated turntable setup! Get in touch! His alternate persona, Ryan Miller, works in the field of Search Engine Optimization.